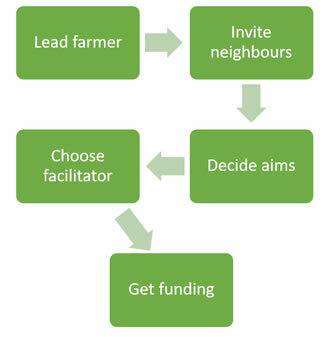 Every farmer cluster story is different, but there are similar stages for each group. The first farmer clusters were formed with the steerage of GWCT farm advisors, but increasingly, farmers are setting up their own groups after hearing about the initiative from other farmers, the GWCT Farmer Cluster conference, agricultural media, regulators and policymakers. By utilising friendships, business acquaintances/networks and other relationships, the Lead Farmer reaches out to potential farmer cluster members. The first gathering is usually somewhere informal like a household or local pub, and it is attended only by farmers at this stage. If an agricultural/environmental professional was involved from the start, they may play a part in this informal meeting. What issues do we have in common that are easier to address as a group? What species are iconic or declining in the area? What habitats do we have that we would like to enhance or extend? Can we improve the quality of the local watercourse and/or address flooding? Are there any ways in which we can collectively approach business/marketing? How can we reach out to local communities? This person must be chosen by the farmers themselves (or approval confirmed if they have been involved from the start). The chosen aims of the cluster will ultimately inform who is chosen to facilitate the group e.g. a catchment focussed group may choose to approach a Rivers Trust Officer, or a cluster with broad range of target wildlife species may choose to approach a FWAG advisor. In any case, the facilitator should be appropriately skilled and connected, preferably achieving or aspiring to meet an industry standard (such as the BASIS Certificate for Conservation Management).